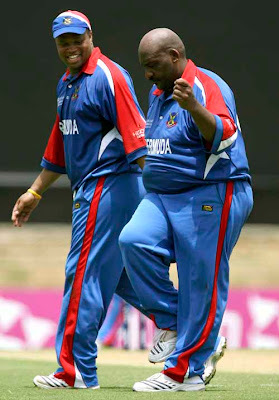 Cricket is definitely not a game that demands fitness. There is also no actual thrill in watching the game too, except a very few rare games. The game's pace is very slow, comparable to that of golf or chess. I wonder why people in India are so crazy about such an ugly game, under a 'gentleman's game' tag. If they call it a gentleman's game, why do they not make it one. People abusing each other, racial comments, slapping etc. etc. I am not saying that these things are wrong in a game. But at least do not pretend to be a gentleman if you are not. Brazil playing against Russia, in Russia, under -13 degrees, and playing in shorts and a T-shirt. Oh! but our delicate gentlemen, they are going to run for their woolen uppers even if they are playing in Shimla, and that too in Summer. The game is such, what these poor guys can do. Such an unnecessarily over hyped game is Cricket, in India. Just because maybe Indian people are lazy, and carry the 'who cares attitude', the same as the game is or because India is only good in Cricket. Because of this unnecessary over hyping and monopoly of the game, here in India, no other games flourish or galore. Hockey died gradually. I wish the same happens with cricket as well.